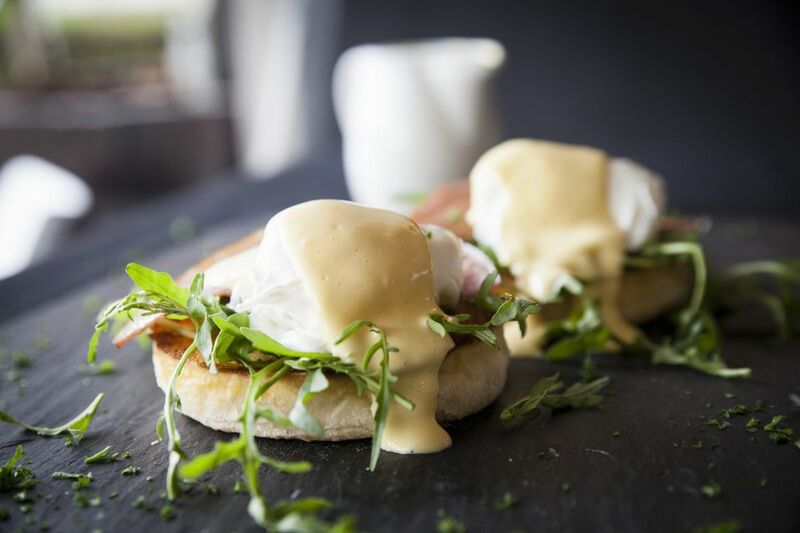 Hollandaise sauce is a rich, lemony emulsified sauce made with clarified butter and egg yolks. It's important to use clarified butter because it'll help stabilize your Hollandaise so that it won't separate later. 1 cup clarified butter (about 2½ sticks before clarifying). The butter should be warm but not hot. In addition to what's listed above, you'll also need a saucepan with an inch or two of simmering water, a whisk and a bowl— either glass or stainless steel, but not aluminum. 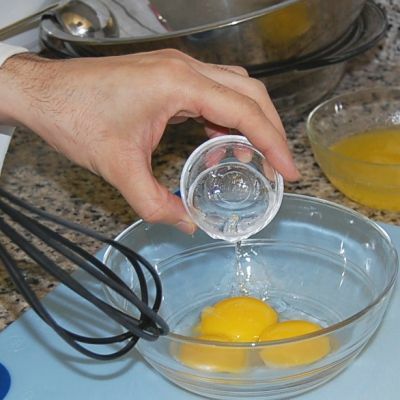 To begin, combine the egg yolks and the cold water in your bowl. A tablespoon of water will get cold in just a couple of minutes in the freezer. Whisk for a minute or two, until the mixture is light and foamy. Whisk in a couple of drops of lemon juice, too. The acid from the lemon juice helps the egg yolks absorb more butter, so you get a richer, creamier Hollandaise sauce, and one that's less likely to break. Set the bowl directly atop the saucepan of simmering water, thus creating a sort of double-boiler effect. Note that the water itself should not come in contact with the bottom of the bowl. It's the steam, not the water, that should be doing the heating, so don't overfill the saucepan. By gently heating the egg yolks, we're altering the proteins in a way that makes them bond more effectively with the fat droplets in the clarified butter we're going to be adding. This creates a more stable emulsion, meaning your Hollandaise is less likely to curdle. At the same time, though, we don't want to get the yolks too hot, either. Egg yolks lose their emulsifying powers when cooked, which is why we use this gentler, less direct method of warming them. Plus, if you heat the yolks too much, you'll have scrambled eggs. Add the melted butter slowly at first, a few drops at a time, while whisking constantly. If you add it too quickly, the emulsion will break. It's important to keep everything moving around so that the butter is evenly dispersed. As the sauce thickens, you can gradually increase the rate at which you add the butter. As you can see here, the sauce has thickened quite a bit. Whisk in the remaining lemon juice and season to taste with Kosher salt and cayenne pepper (or a dash of Tabasco sauce). The finished Hollandaise sauce will have a smooth, firm consistency. If it's too thick, you can adjust the consistency by whisking in a few drops of warm water. You can hold a Hollandaise for about an hour or so, provided you keep it warm. One way to do this is to set the bowl atop the saucepan of warm water you used earlier. Letting it cool can cause it to break, although it can be rescued by whisking in some hot water. Likewise, it can break if it gets too hot (Hollandaise is a bit like Goldilocks), in which case whisking in some cold water can sometimes save it. In no case, though, should you keep it longer than a couple of hours; after that, you should just toss it.